Associate Professor of Biochemistry Ben McFarland continues his study of the chemical properties of biological compounds (carbohydrates, lipids, amino acids, proteins, and nucleic acids), metabolism (biochemical energetics, enzymes, electron transportation, and oxidative phosphorylation), and the integration of metabolism (biochemical genetics, metabolic regulation) in his series of Winter Quarter 2013 lectures. Assistant Professor of Biochemistry Ben McFarland studies the chemical properties of biological compounds (carbohydrates, lipids, amino acids and proteins, and nucleic acids), metabolism (biochemical energetics, enzymes, electron transport, and oxidative phosphorylation), and the integration of metabolism (biochemical genetics, metabolic regulation). Series of Autumn 2012 course lectures. 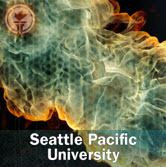 The Erickson Conference showcases the outstanding research contributions that SPU students make in the fields of Biology, Biochemistry, Chemistry, Computer Science, Engineering, Mathematics and Physics. Students present the findings of their individual research projects.